A jam-packed, bursting-at-the-seams schedule is often a big contributor to the mess in our homes. When we allow ourselves to get so busy that we don’t know which way we are coming or going, our decluttering efforts, and the routines necessary to maintain a minimalist home, fall apart. We neglect to guard our homes against the influx of new stuff we so desperately want to keep out, and progress halts. Mail sits on the counter instead of going immediately to the recycle bin or trash can. Things get left in the car rather than put away right when you get home. One load of laundry undone turns into two or three; dinner dishes get left until morning. If the ‘busyness’ goes on for too long, we can begin to head in reverse. It becomes a revolving cycle of chaos-stuff goes out, we get busy, stuff returns, we send it back out the door, wondering where it came from, and the cycle repeats. This phenomenon becomes more prevalent at certain times of the year, but for many, the holidays are the prime time for the return of chaos. During the holidays, it’s easy to get caught up in our ‘ideals,’ with all the ‘supposed-tos’ and ‘have-tos’ we create for ourselves. The fantasy life can come out in full-force. Add in the pressure to be at every party, to participate in every extra performance, the gifts from kind-hearted people who love to give at this time of year, and the pressure to reciprocate with the perfect gift, and….. The holidays become the perfect storm for chaos, at the time of year we crave peace and joy the most. 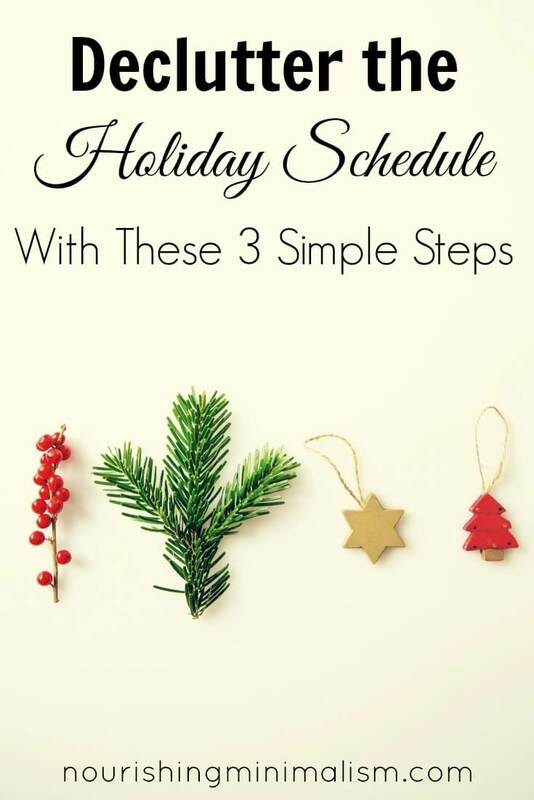 Whether you are one of those people who loves the holiday season and who reminds everyone there are only ‘x’ weeks left, or you are one of those people who panic, then procrastinate, the holidays are just around the corner. 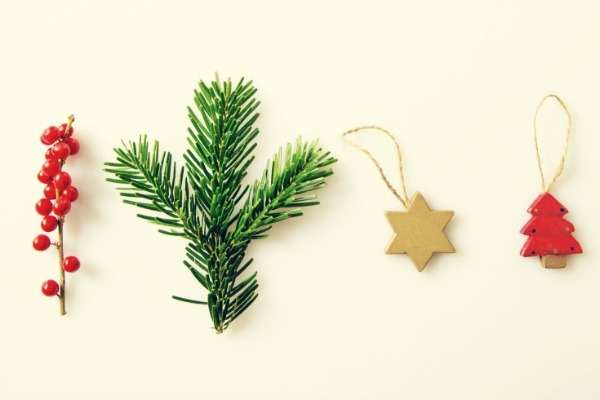 Taking some time now to plan and prepare can go a long way towards finally having peace and joy during the holidays, instead of chaos and the return of clutter. We want to create holiday memories to last a lifetime; we want our kids to have every good opportunity. We want to give back to others in need; we want to give thoughtful gifts to our loved ones. We want to attend all of those parties and performances. But we only have so many hours in the day. We cannot do it all and maintain a peaceful home at the same time. Sometimes we have to say no to activities, even good ones, and that’s okay. Remember, as an aspiring minimalist, you already know that less is usually more. This is true when it comes to the holiday schedule as well. Once you accept that you cannot do it all, you can focus your time and energy on the activities that matter most. Once you’ve accepted that you can’t do it all, you can now spend some time thinking about what things matter to you and your family. What activities are essential to you, and your loved ones, during the holiday season? What activities will create memories you and your family are going to cherish down the road? Put those things at the top of the list, and let the rest go. When you take the time to think about it, some things are easy to cut out of the schedule. It becomes easy to say no to running from point A to B, trying to find the best deal on this toy or that. Choosing not to run right out to the store to buy a gift, because someone just gave you one and now you have to reciprocate, or saying no to a holiday party can be a little more difficult. In those instances, challenge your thinking. How is that really going to achieve the holiday you are trying to create? Is the gift you randomly buy really going to be meaningful to them? Is there another way you can show your appreciation without undermining your peaceful, holiday schedule? Like we considered above, as much as we want to, we can’t do it all. Many good things happen during the holidays. Finding peace is a result of choosing which things to participate in. Remember, if not this year, there’s always next year. Do you ‘have to’ prepare a 5-course gourmet meal? Or is a potluck good enough? Do you ‘have to’ bake ten different kinds of cookies, or is one enough to create a lasting memory? Do you ‘have to’ attend every party you’re invited to? Being more present in the things that you deem important, is far superior than doing ALL THE THINGS but being stressed, overwhelmed and mentally scattered. Quality over quantity. Remember, less is more. Be willing to let go of the less important to create more room for what is most important during the holidays.